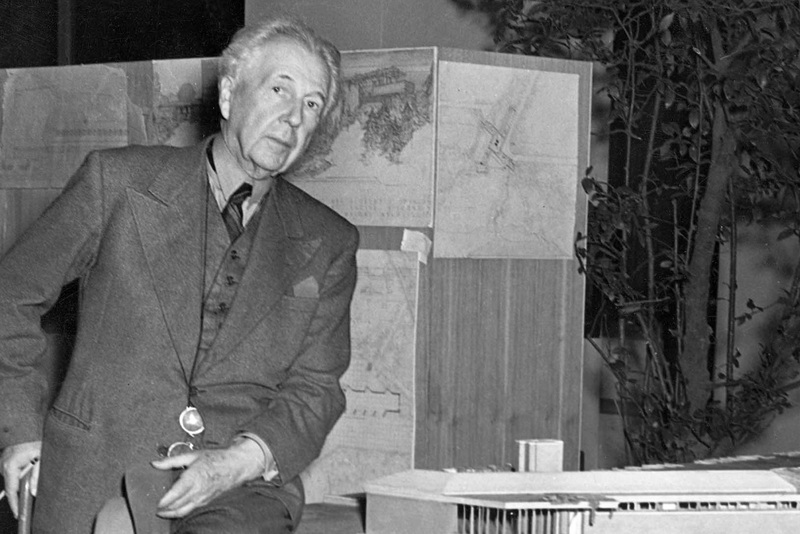 Frank Lloyd Wright was born on June 8, 1867 in Spring Green, Wisconsin. Early on, his mother influenced his career in architecture by emphasizing the importance of education and by introducing him to Froebel Blocks. Although Mr. Wright designed many structures in his lifetime, he was truly an architect of houses. His philosophy of organic architecture focused on the harmony between the building and its natural surroundings. “The house of moderate cost is not only America’s major architectural problem but the problem most difficult for her major architects,” said Wright. This inspired him to design the Usonian home, the concept of an affordable home to serve the masses, and a home that is uniquely American. Over the years, Frank Lloyd Wright designed over 500 structures, many of which still survive today. He was ninety-one years old when he died, leaving such architectural masterpieces as the Robie House in Chicago; Taliesin East and West in Wisconsin and Arizona respectively; The Johnson Wax Buildings in Racine, Wisconsin; Fallingwater in Pennsylvania; and the Solomon R. Guggenheim Museum in New York.